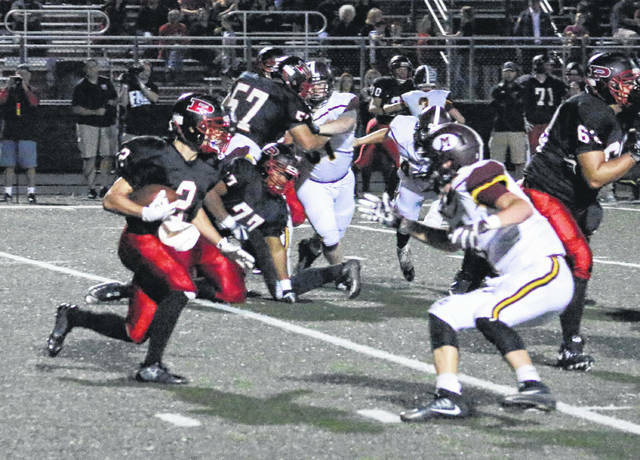 Point Pleasant junior Josh Wamsley (2) runs with the ball during the first half of Friday night’s Week 8 football contest against Meigs at OVB Field in Point Pleasant, W.Va.
A pair of big winners. Both Point Pleasant and Wahama came away with resounding victories on Friday night during Week 8 high school football action within Mason County. The Big Blacks (6-2) led wire-to-wire and built a 28-0 halftime advantage en route to a comfortable 56-16 victory over Meigs at OVB Field. The White Falcons (3-5) snapped a two-game losing skid against host South Gallia by posting a convincing 41-6 decision at Rebel Field in Gallia County. The results of Hannan’s Homecoming contest against Paden City was not available before press time. Point Pleasant returns to action Friday when it hosts Man in a Week 9 contest at 7:30 p.m.
Wahama plays its final regular season game at Bachtel Stadium on Friday when it welcomes Miller in a TVC Hocking contest at 7:30 p.m.
Hannan begins a two-game road trip next Friday when it travels to Gilmer County for a 7:30 p.m. contest. Due to an early deadline, the Mason County gridiron games from Week 8 will be available in full detail in the Tuesday sports edition of the Point Pleasant Register. Game stories will be available online at mydailyregister.com before appearing in print. https://www.mydailytribune.com/wp-content/uploads/sites/42/2017/10/web1_10.14-PP-Wamsley.jpgPoint Pleasant junior Josh Wamsley (2) runs with the ball during the first half of Friday night’s Week 8 football contest against Meigs at OVB Field in Point Pleasant, W.Va.